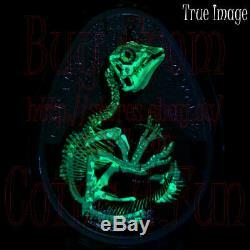 Store Category: Glow In The Dark. 2018 - Hatching Hadrosaur - Glow-In-The-Dark Pure Silver Coin. There are few places in the world where dinosaur embryos have been discovered, but Canada is one of them. In 1987, eggshells found at Devils Coulee, in southern Alberta, led to the discovery of one of the largest dinosaur nesting sites in North America. There, palaeontologists from the Royal Tyrrell Museum unearthed the fossilized remains of. Nests, eggs, even embryosa rare find for a species that roamed the land 75 million years ago. A young duckbill dinosaur emerges into a new worldourson our latest prehistoric-themed offering. The fine silver coin is the perfect shape for a colourful depiction of a baby. Breaking free from its egg against an engraved forest backdrop. 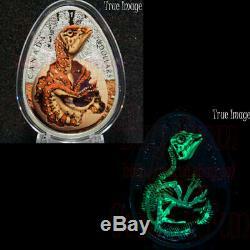 A glow-in-the-dark dinosaur coin, perfect for fans of all ages! 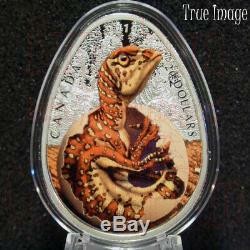 Your coins egg-like shape is the perfect fit for a dinosaur egg theme, and is our first egg-shaped dinosaur coin! When activated, glow-in-the-dark technology reveals a hidden image: the skeleton of the young. The design has been expertly reviewed by Albertas Royal Tyrrell Museum of Paleontology. In addition, your coin highlights the 1987 discovery of one of North Americas largest dinosaur nesting sites. NO NEED TO REMOVE IT FROM ITS CAPSULE! The glow-in-the-dark technology can be activated through the capsule. The Royal Canadian Mint certifies all of its collector coins. LIMITED MINTAGE: Only 4,000 coins will be made available worldwide. ONE OUNCE 99.99% PURE SILVER COIN! Csotonyi, your coin has been reviewed for scientific accuracy by palaeontologists at the Royal Tyrrell Museum of Palaeontology in Drumheller, Alberta. It features a coloured rendering of a young. As it may have appeared 75 million years ago. The hatchling emerges from its egg against an engraved prehistoric landscape of evergreens, conifers, shrubs and low plants. Uniquely shaped beak is viewed in right side profile as the hatchling looks up; it does not yet have the bony crest that is a distinctive feature of the adult. Glow-in-the-dark technology reveals fossilized remains that are based on those uncovered at Devils Coulee in southern Alberta. Hatchling measured about a metre long. But by the age of 10, its full adult size was 10 metres long. They had to outgrow predators such as tyrannosaurids and dromaeosaurs in order to survive. Each egg was approximately 20 centimetres in diameter, or roughly the size of a volleyball! Similar to the nests of modern crocodiles. Eggs would have been buried under a mound of vegetation for incubation. Decomposition of the plant matter would have produced the heat required to incubate the eggs, since parents were too large to sit on the eggs like modern birds do. Had a hollow crest on top of its head. This bony feature was connected to its airways to amplify its call, so others could hear it from far away. These plant-eaters had thousands of teeth, with new ones replacing older ones as they wore down. Belongs to the hadrosaur family, dubbed the duck-billed dinosaurs, which were one of the most common dinosaurs to roam North America during the Late Cretaceous period. Your coin is encapsulated and presented in a Royal Canadian Mint-branded maroon clamshell with a black beauty box. 45 long x 33 wide. I do leave feedback for everyone. 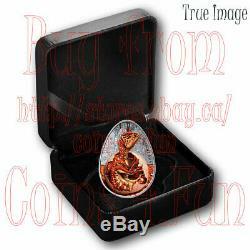 The item "2019 Hatching Hadrosaur Dinosaur Egg $20 Glow-In-The-Dark Pure Silver Proof Coin" is in sale since Monday, February 25, 2019. 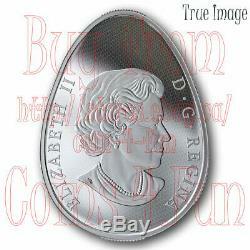 This item is in the category "Coins & Paper Money\Coins\ Canada\Commemorative".fun" and is located in Ontario.